A weekend’s paper dream: I had a great afternoon in art gallery ‘Presentatiestudio van Bureau Jacobine van Beurden‘ in The Hague. 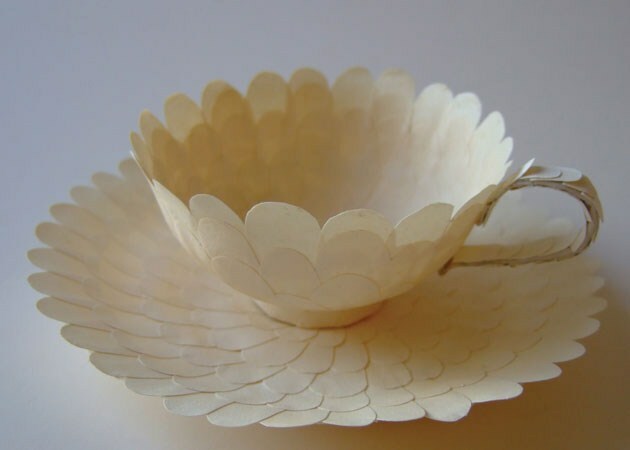 Paper artist Loes Schepens exhibits fragile works of art made from handmade paper in her exposition ‘Raakvlak – werken van papier Loes Schepens’. 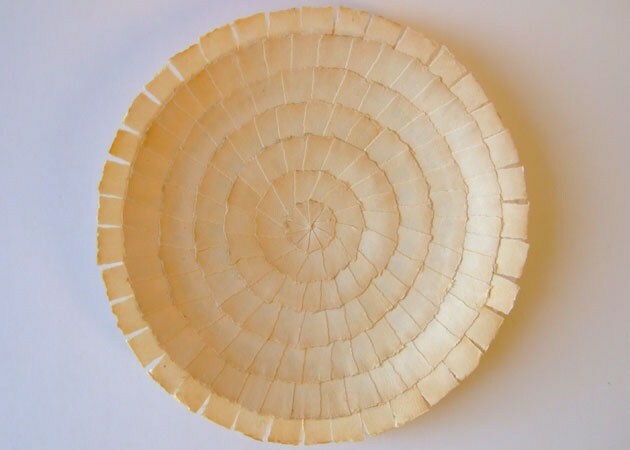 Years of working with paper, taking classes all over the world, experimenting with paper resulted in beautiful work. Loes combines handmade paper with yarns, she dyes paper pulp in indigo, and experiments with a lot of different fibers. Asparagus are her favorite fibers, but I spotted a piece of paper with with delicate elderflowers which I also loved a lot. Listening to Loes’s stories and knowledge about paper is very inspiring. She knows about special ritual bamboo papers and gold leaf in Birma, about making paper in Korea, about the Japanese way of making paper, about dye colours from Peru. You can see and feel all this experience, vibrance and wanderlust in her paper objects. I like the way Loes is experimenting. The knots are a perfect example of her tests. Loes folded the paper pulp when it was still a bit wet. For her first attempt she used paper pulp made of cotton fibres, the new series of knots have been made of flax fibers. Last summer text writer Laura van Mourik nominated me for the next Boekblad column “De keuze van…”. It had to be a published book, which was easy to buy. A few weeks before I knew I had to write this column I saw a beautiful photobook. The spectacular cover immediately caught my attention. The title and an abstract linear pattern have been embossed in the cover paper which has a subtle relief so it looks like fabric. The book has a rather challenging name: ‘Motsure Hotsure Tsumugu’ of photographer Marco van Duyvendijk. This photobook tells the story of the kimonos of the sub-tropical Japanese island Amami Oshima. Once hundreds of thousands of fine handmade silk kimonos were made here, but nowadays the demand is not so big anymore and only a small number of highly skilled craftsmen create these formal garments. The photos of Marco van Duyvendijk show the labor-intensive process of dying and weaving. The natural dye colors are exceptional. Amami Oshima is well know for the use of mud dying, but indigo-dying is also used frequently. The mud-dying technique is very intensive; the silk has to be dipped twenty times in natural dye made from the pulp of a local plum tree. After the dipping the paint specialist washes it for one hour in iron-rich muddy water. The chemical reaction creates the characteristic red dark colour. Although the subject of the book is interesting enough to catch the attention, the design of this book is also stunning. Like I wrote before, the cover is very tactile, you just have to touch it! The cover has both on the front as at the back an extra wrapper which contains two mini-booklets. These booklets are simply connected to the main-cover with a blue pamphlet stitch. The cover of the first mini-booklet shows a fabric pattern and all the information about the book and the photos can be read in here. For example the title, which is only on the cover in Japanese. The booklet at the back features reproductions of paintings by Haruka, the translator and travelling companion of Marco van Duyvendijk. 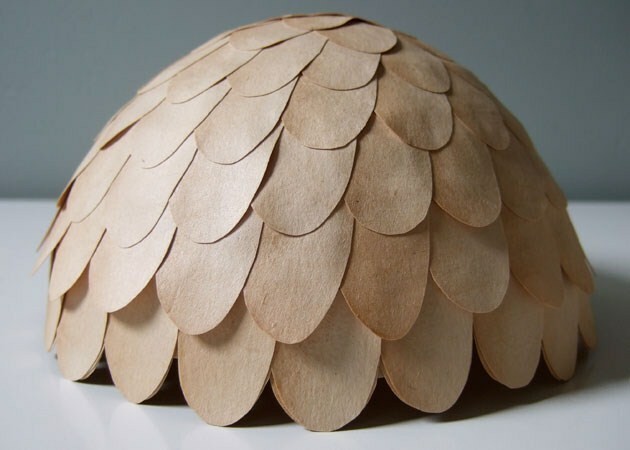 Molly M designs takes laser cutting to the next level. Wow! was the first thing that came in mind when I saw her designs. Multilayered, beautiful use of colors and refined. According to Molly McGrath good design is “a synthesis of a good concept, elegant or creative form, interesting use of material, attention to details and connections, and thoughtful consideration of use”. A great inspiration for her are pattern and form, including botanical morphology, textile design, building geometries and optical illusions. In Particular, Molly was and is inspired by Morocco. The patterns and colors of a rug bought in the High Atlas mountains were , for example, a base for a jewelry collection. She doesn’t only produce jewelry, such as earrings and necklaces, but also coasters, leather pouches and most beautiful of all laser cuts prints for on the wall. The focus of Molly M designs is on ethical material sourcing, accessible pricing and conceptual integrity. The designs are made from sustainable materials, such as bamboo, birch from responsibly farmed forests, wool salvaged from surplus army clothing, suede, leather, fabric, paper and even scraps from local cabinetmakers. What inspires me most in this design is the layering. Not simply a cut out form, but several stacked layers, complementing each other strongly. Want to see more of Molly’s design, you can find more information at her website. … sometimes you see things that just make you speechless … the paper art of Maude White is such a thing; white, delicate and fairylike. Maude started cutting paper as a way to communicate to the observer what her words could not do effectively. She feels that if she peels the paper back, the outer superficial layer of our vision reveals the secret space beneath. The negative space tells it own story. What appeals me most in Maude’s story is her great respect for paper. She sees the paper as something strong, reliable and constant. Paper is everywhere and it has been telling stories for centuries. By respecting and honoring paper Maude feels like she is communicating some of the pleasure it brings her. In an interview with Ted Baker Maude says that the longest she ever worked on a piece was a month – but not full time -. Working is a kind of a meditative exercise, so she don’t exactly knows how long she works on each piece. 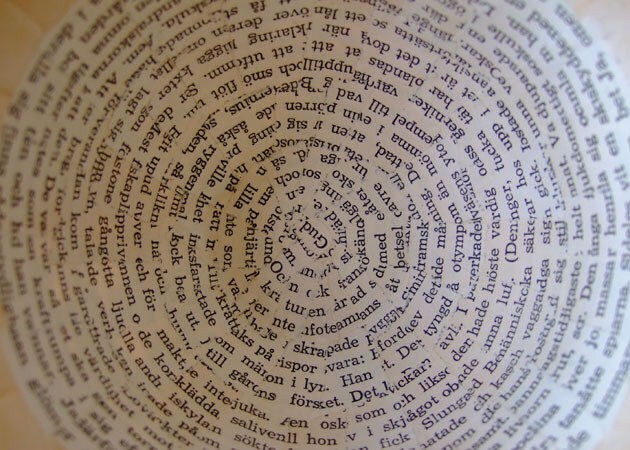 Each fine line and swirl has been meticulously sliced out with a sharp knife and a steady hand. She is inspired by illustrators such as Maxfield Parrish, Arthur Rackham and Gustave Dore, illustrators from the end of the 19th century. You can buy Maude’s art at Etsy. A few weeks ago I made small edible booklets from marzipan and fondant. When the fondant was still soft my logo could easily be pressed in the cover. These miniature books, as sweet as honey, were a great success at the networking event where everyone had to take something eatable to represent his or her company. Besides that it was fun making these books and receiving a lot of eatable gifts from other entrepreneurs, it also brought me into a new world; the world of edible books. Books are made from paper, ink and cardboard, so my first search was targeted at these ‘ingredients’. Books are often sewn with thread, a quick search yielded several edible ropes. For example dried Japanese Japanese bottle gourd or ropes from the fibers of nettles. This is only a very short enumeration of the possibilities. Each project requires its own ingredients. Design and inoovations agency Korefe made a cookbook that can actually be read and eaten. 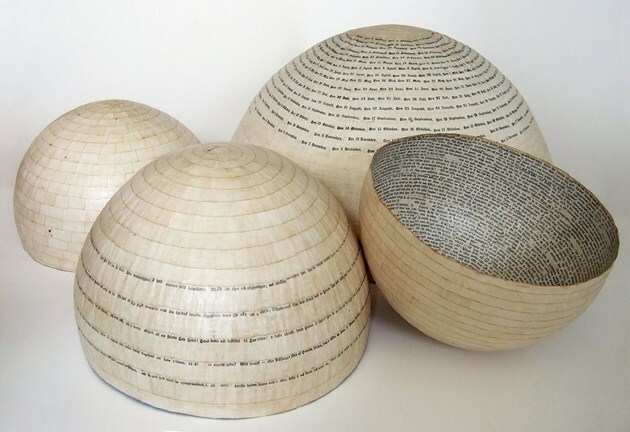 The book is made out of fresh pasta and can be opened an read. Afterwards you can fill it with ingredients and put it in the oven. The Dutch cook, Pierre Wind, made an edible book from ouwel/wafer, marzipan and licorice laces called Doekoe voor boekids. Do you have a special example of edible books or ingredients, don’t hesitate to let us know in a comment. Looking for a special book? Prien is always in for an adventure. Please contact me, so we can discuss the possibilities. Last week book designer Irma Boom won the Johannes Vermeer Prijs, the Dutch state prize for the arts. In an interview with De Volkskrant Boom says that she sees the prize as an appreciation for the graphic arts industry in The Netherlands. This industry can use some encouragement, because fewer and fewer books are printed and bound. Luckily Irma Boom believes that the book has a future, even in this digital century. She thinks that a book is more necessary than ever, to bring slowness and deepening in people’s lives. A book slows, it makes you choose another rhythm. Boom sees a book as ‘frozen information’, with a fixed order, so that the reader can reflect and derive meaning from the design choices of the compiler. In contrast, internet is chaotic, without focus and temporary. Boom says it is not only the order that gives a book extra value, but also the touch of the pages and the book edges. Her Chanel book is all white with blind printing, so you can see the content at floodlight, or you can feel it with your fingertips. The book edge of the Sheila Hicks book is frayed and feels like cotton. Sometimes little wonders just happen. Do nothing .. be a bit lazy … and … tadaa … the magic is there. Last summer my father in law gave me a lot of iron heavy weights to press booklets and other stuff. The only thing I had to do was paint them, because they were really rusty. The cardboard I used as underground was put aside and forgotten … until I found it again and was stunned by the colors the rust had left. Lille … also known as ‘Paris of the North’ … nice to visit for one day! Last Tuesday we took the Thalys from Rotterdam and in two hours we were in Lille. Arriving at Euralille isn’t exactly the best way to enter the city. This modern concrete monstrous environment doesn’t give you a warm welcome … but within five minutes you forget about that. Lille is a beautiful French-Flemish city, very nice to stroll around. There are plenty of nice boutiques, salons de thé and restaurants in ‘La Vieille Ville’, the old city. Winding cobblestones streets, ancient facades – often very colorful -, hidden passages and nice squares. In short it is a feast for the eyes to walk through Lille. Unfortunately the museums are closed on Tuesdays, otherwise we certainly would have visited Le Palais des Beaux-Arts or the museum of modern art. Fortunately the shops were open, and we managed to find a really nice one; L’Atelier La Sorciere Verte, a boutique for paper artists, writing and bookbinding. In French it even sounds better: Boutique de Créateurs en Papeterie, Ecriture & Atelier de Reliure. A lovely shop to nose. A lot of beautiful paper! When you are in Lille and you love paper, don’t forget to visit this shop! 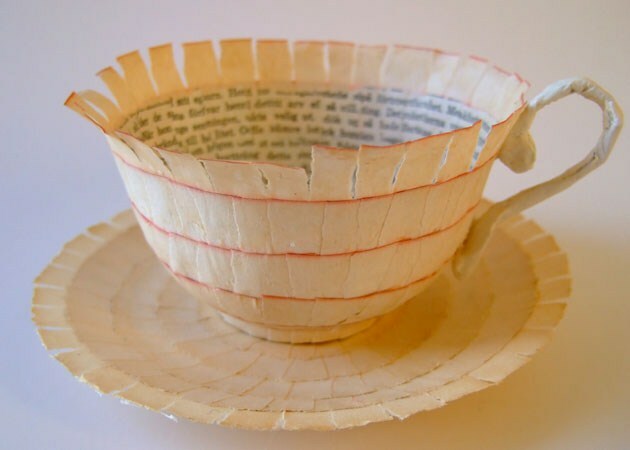 … wow … Swedish bookbinder gives old books a beautiful second life!